NFL Onesie 3 Packs for your youngest fans! Up To 70% Off! You are here: Home / Great Deals / NFL Onesies – 3 Pack Up To 70% Off! 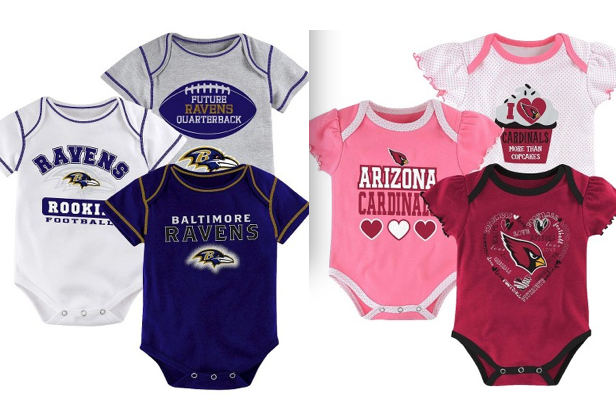 NFL Onesies – 3 Pack Up To 70% Off! Head over to Target to get these cute little NFL Onesie 3 Packs for your youngest fans! Make sure the babies are supporting the favorite family team! Some of these NFL team one are on clearance for up to 70% off. Teams and sizes are limited and going fast so don’t wait! Remember, shipping is FREE sitewide now on Target.com with NO minimum and as always, if you have a REDcard you will also get an additional 5% Off plus FREE Shipping no matter how much you spend.